In the recent weeks, we've been engaged in a study of God's great Grace. We've seen that Grace is greater than our failures. We have seen that Grace has freed us from the Old Covenant Law. We have seen that Grace has brought liberty whereof we are not required to observe any special day or partake of any type of ceremony to advance in faith or achieve a deeper spiritual intimacy with God. God's Grace is greater than we can fathom. Grace is so far reaching and knows no boundaries. It turns the hardest and coldest hearts. His Grace stoops to the lowest most undeserving one offering hope and new life. His Grace has appeared to all men in the person of Jesus Christ. In spite of this great Grace being revealed so many still only see Grace as a minor portion of the Gospel. That it was only part of the motivation that moved God to pay the price and offer new life. It is only utilized for the Gospel invite but once received it is no longer consequential. Devotion and consecration are what is paramount and is all that is of significance. Personal commitment and devotion and determination are what the Christian life is founded on. There is no place for Grace for believers. Think openly and with honesty. We hold our hands out offering hope for hopelessness and light in the darkness. We strive to bring in the multitudes to hear the good news. There is a Savior. There is forgiveness, we proclaim. We are quick to declare there is nothing you have done that will disqualify you from receiving. Then, the lost, the hurting, the sinner hears and responds with open hearts and hesitantly comes forth and receives this good news. Then the lost who is now found sees there is no longer a place for Grace for believers. You've responded, now the open hands with their invitation of unconditional love and acceptance close and a finger comes forth pointing out all your flaws and misdeeds. The open hands become clinched fists angrily preaching about the lack of devotion and commitment among the found. Finally, these open hands sometimes become hands closed clinching stones to throw at the fallen among us. The truth is God's Grace is greater than our flaws. His Grace is greater than any achievements we strive for. His Grace is greater than our commitments. Because we try, we promise, we make pledges but we in our fleshly frailness often times come up short. Grace says He is the missing element in any and all equations. The Gospel is Grace from start to finish. The Christian life is predicated on the great Grace of Almighty God. No amount of devotion causes His favor or love or mercy or hope to shine more upon us. The way His favor and love and blessings flow upon us in a greater measure is when we simply agree with Him and identify with who we already are, the righteousness of God in Christ. The ministers and believers who see Grace as a minor part of the Gospel are missing it in a couple of ways. One, they are walking by sight not faith in God's Word. His Word declared we who believe are righteous and holy and redeemed and eternally secure. Many times they walk by their senses and see the failures and shortcomings of the Church. So they attempt to front load the Gospel. They teach if a believer isn't committed or devoted or persevering to the level they deem acceptable they must not really be saved. I've even heard a minister once say if a professing Christian was caught up in a specific sin or they didn't believe exactly what he did they weren't "true" Christians. They were merely a "believer". They were some type of lower class Christian. Secondly, they are entrenched in Christian guilt. Because those of us in the West aren't being driven from our homes or being massacred or beheaded for our faith we aren't truly dedicated. The believers who have suffered so much in certain nations hostile to Christians are the real Christians. One theologian that is immensely popular coined this phrase "cheap grace" in this vein. Because Christians don't stand up and allow themselves to be murdered they must not be truly committed. They make catchy slogans. Things like Christ died for you will you die for Him? I trust that you can see this Christian guilt. This guilt in my view is what is motivating some of this extreme commitment and consecration and devotion and persevering achievement goals intending to prove one's genuine salvation. The truth is God's Grace freely offers all who will hear and respond new life. We freely receive all He accomplished for us. There is no commitment or obedience requirement to receive salvation. Salvation isn't Jesus plus your commitment to long-term obedience to God. It isn't Jesus plus your achievements and consecration. It is not Jesus plus your bravery and courage enough to suffer and die. 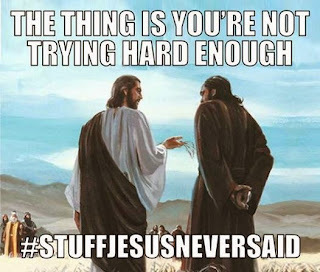 It is Jesus plus nothing. Salvation is by Grace through faith. Free your mind from this never ending treadmill of duty and achievement syndrome. Reject any guilt over any blessings and goodness you have because of where you live and what Christ has done. Christ doesn't need our help to perfect us or mature us. Maturity and growth come simply by renewing our minds to our new identity in Him. When we acknowledge as often as we can who we are in Him growth occurs. As for those suffering for their faith, we do all we can to help. We provide aid and support through charitable means. We pray in faith for their protection. What we don't do is create a theology of works to compensate for us not "suffering enough". Brethren, renew your minds to this great Grace. Understand where the "you're not trying hard enough", "there is still much more to do" mindsets originate from. Those looking at behavior instead of trusting God's Word and His Spirit to renew and awaken and bring growth and change. Or it's rooted in those so entrenched in guilt for freedoms and blessings they have. We no longer have to prove our worth. God freely giving us His own Son reveals our worth to our good Father. So simply and freely receive all His Grace has purchased and provided. Very thoughtful and provacative--Christian guilt and peer pressure has sent many overseas ill-prepared and caused many to become indebted sponsoring those going overseas unprepared! This is why I strongly believe in new converts being baptized in the Holy Spirit first and foremost, even before reading the Bible or joining any church group project or event. Not that these things are wrong or damaging per se, but without the Counselor with and within the believer, it's very easy to fall prey to all kinds of weird stuff that's out there.